Cake in bed and no crumbs? It’s no longer just a dream. You can now have your cake and eat it too. In celebration of Allswell’s first birthday, the home brand partnered with Mini Melanie Dessert Shop to create a specially-designed, crumbless cake that was conceived to be eaten in bed. 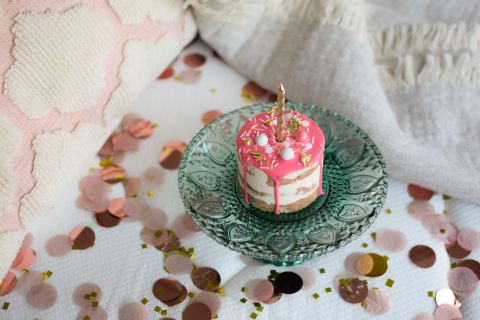 Crafted by “Chopped” champion chef Melanie Moss, the limited-edition, custom birthday cake is vanilla funfetti flavored with a whipped cream filling, white chocolate ganache glaze and is topped with gold flakes and rose gold sprinkles. The recipe utilizes extra fine pastry flour and a proprietary vanilla cream recipe that masterfully combine to make the inside of the cake crumbless. The new crumbless cake in celebration of Allswell’s first birthday tops off a first year of business and creative engagement from the brand who renamed the king-sized mattress the “Supreme Queen” in honor of women who deserve the highest honor; brought a royal mural to the streets of New York with renowned graffiti artist Kelsey Montague; empowered moms across the country to #BantheBrunch and stay in bed; and just launched a cross-country tour of the Allswell Tiny Home. Ready. Set. Eat in Bed. The Allswell birthday cake is currently only available for delivery in New York City, but those that live elsewhere don’t need to lose sleep over it. The brand also created crumbless birthday truffles utilizing the same crumbless ingredients. Available in a 12-pack of funfetti, lemon poppy and chocolate espresso flavors, they are the perfect indulgent bed treat. It’s almost too good – and tasty – to be true. In celebration of its birthday, Allswell is gifting free birthday truffles to everyone who buys a mattress on www.allswellhome.com on March 12, 2019. After checkout, purchasers will be sent a unique code with instructions on how to redeem their treat. The limited-edition Allswell birthday cake and truffles are also available for purchase on www.minimelanie.com from March 12 - April 12, 2019. The birthday cake retails for $18 and the 12-piece truffle set retails for $36. Allswell is committed to bringing a good night’s sleep to all with disruptive price points and amazing comfort. The brand provides a seamless digital experience for crafting a dream bed; from the optimal mattress to the perfect accent pillow and everything in between. The Allswell Luxe Hybrid measures a full 12-inches tall and comes with a built-in plush topper. Sold out on its first run, this luxe mattress starts at $585 for a Queen. The brand’s newest mattress, The Allswell mattress, features Hybrid technology, three types of performance memory foam, individually wrapped coils and added edge support. With a Queen-sized mattress starting at just $345, The Allswell disrupts the Hybrid category with unreal pricing for the value. We believe everyone deserves to feel Allswell. We are dedicated to offering high-quality products – starting with luxe mattresses and bedding – featuring innovative technology and unbelievable comfort at unreal prices. By charging less, we can serve more, redefining the new price of home luxury, and spreading the feeling of Allswell. Get inspired at allswellhome.com.